The No. 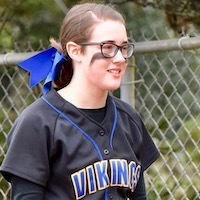 3-ranked Junction City Tigers ran their winning streak to nine games in a row Friday, sweeping the Siuslaw Vikings in a Sky-Em League softball doubleheader at the Siuslaw Softball Field. Siuslaw fell to 0-3 in league and 0-9 overall. Junction City is 3-0 and 10-2. The Lady Vikings host Elmira at 5 p.m. Tuesday. "In an injury depleted varsity roster and with athletes playing out of position," Siuslaw coach Sean O'Mara reported, "the Vikings went up against the number 2 seed Junction City today and gained some valuable experience on how to handle adversity and face the challenges that that type of team brings to the field. "In each game, the infield consisted of a combination of freshmen and sophomores in three of the four infielder positions." Senior Lupita Figueroa had three of Siuslaw's six hits on the day, including the only Lady Vikings hit in the opener. Figueroa was 2-for-3 in the second game. Sophomore LizBeth Garcia also was 2-for-3 in the nightcap for Siuslaw, with an RBI. Senior Lexi Smith was 1-for-3 with a double and run scored in the second game. In the opener, junior Abigail Bumcrot was 4-for-5 with three runs scored and two RBIs and freshman Jada Fuller 3-for-4 with two runs and five RBIs. In the second game, senior Kamryn Potter was 4-for-5 with four doubles, three runs scored and five RBIs. Senior Taylor Jobe was 3-for-5 with four RBIs and Fuller 3-for-4 with two RBIs and three runs scored. Jenna Kister and Abigail Bumcrot; Nina Aaron and Alexis Smith. 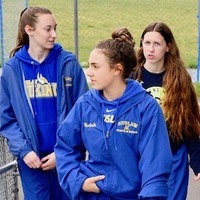 Sydney Collins, Jenna Kister (5) and Abigail Bumcrot.